Each Harp Weekly collects articles, tutorials, and successful community projects, for designers and developers building static sites and client-side applications. 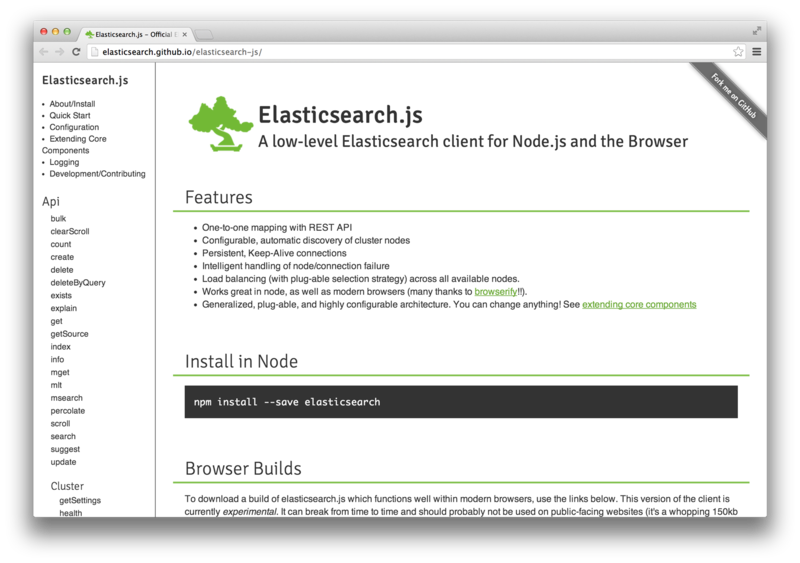 Spencer Alger has released Elasticsearch.js, the official Elasticsearch client library for Node.js and the browser. The documentation site looks thorough, and it was put together using Harp. This week, I was also shown C J Silverio’s terraform-connect, a variant of Terraform—Harp’s asset pipeline. This allows you to run Terraform as middleware, just as you might with Harp. Harp’s documentation for EJS improved this week. Did you know? To create an .xml file instead of the default of .html using EJS, all you need to do is rename it with a .xml.ejs extension? This works in Jade, too: .xml.jade. You can put this to good use by taking a look at how to build an RSS feed in the Harp Recipes section. If you are having trouble with Harp, you’re more than welcome to open an issue on GitHub—but maybe the question has more to do with Jade, for example. Harp now has its own tag on Stack Overflow so, if you’d like, you can also tag your questions with “Harp” and get help from the friendly people of both communities. Ask away! Raymond Camden writes for Flippin’ Awesome about building static sites with dynamic features like comments, calendars, and contact forms. This is a great collection of resources and services that work well with Harp and the Harp Platform. Take a look at the article, Moving to static and keeping your toys. Subscribe to Harp Weekly so you don’t miss the next edition—I think you’ll like what we have to share. You can also follow @HarpWebServer on Twitter.